As the mother of an almost 5 week old, you can imagine the amount of crying I have to endure :). She cries after I’ve exhausted every possibility of what could be wrong, which can be the most frustrating of all because as a parent; I instinctively want to wipe out all that is wrong and make everything okay for my baby. When she doesn’t stop crying, I wonder what I an doing wrong and in many ways, I feel like a failure as a mother. During one of our quiet moments (i.e. she was asleep-lol), I remembered a DVD that was given to me by the hospital entitled “The Period of Purple Crying” (additional information can be found athttp://www.purplecrying.info/sections/index.php?sct=1&). Reading the information and watching the DVD helped me to understand crying as a natural part of an infant’s development. It gave me the validation I needed because it explained that babies cry, even when nothing is wrong. What a relief that was for me!!! After digesting that information, I wanted to soothe and comfort her even more because her cry and my responses to it are a natural part of our bonding and her growth in trusting I will be there whenever she needs me. Granted, I wasn’t ever going to stop trying to comfort her, but knowing I wasn’t doing anything wrong was a big weight lifted from my shoulders. I began to welcome her cries as opportunities to make things better, even though everything is already alright. What an amazing feeling~to make things better when nothing is wrong!!! 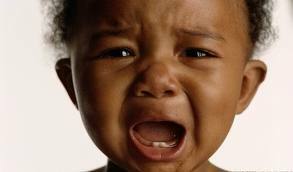 In analyzing the “crying for no reason” factor, I began to wonder why we as adults need reasons to cry? Why is crying often viewed as a sign of weakness? As refreshing and relieving as a cry can be, why must something happen first? We often wait until all of our frustrations are bottled up before we explode into a burst of crying. Or something incredibly remarkable must happen for us to cry tears of joy. Why cant we cry “just because” as a way to release or rejoice? I wonder if babies have got it right and perhaps we need to take a page out of their book.